BALTIMORE (CNS) — There’s a little bit of migrant in everyone, Cardinal Luis Antonio Tagle of Manila, Philippines, said during a U.S. visit. The story of human history is one based on people moving around the planet in search of a better life and it is humanity’s responsibility — and the church’s — to welcome travelers and meet their needs, Cardinal Tagle told Catholic News Service Feb. 14 at Catholic Relief Services headquarters in Baltimore. To ignore the needs of another person is to ignore the needs of a brother or sister, he said. And by understanding that each person, especially those who are migrants or forcibly displaced from their homeland, is a on a journey to God, then perhaps the barriers that keep people separated from each other can be overcome, he said. “Our basic contribution as church is to put the human face on the person” and help share their journey to hope, security and freedom, he said, referring to the two-year Share the Journey campaign of Caritas Internationalis. The campaign, introduced in September by Pope Francis, invites people of faith to interact with and welcome migrants and forcibly displaced people who are struggling to survive in the face of economic and social oppression, war and criminal violence. “We are dealing with human beings. These are human persons,” said Cardinal Tagle, who is president of Caritas Internationalis, the church’s worldwide federation of relief and development agencies. “The Share the Journey campaign is really to develop a culture of personal encounter. Hear their stories and then discover their humanity. “To discover their humanity is to discover your own humanity, how they are just like us. They have the same dreams. This mother is like any mother who will fight for the safety of her child. This father is like any father whether they are Christian or Muslim or what, who will take risks for his family,” he said. 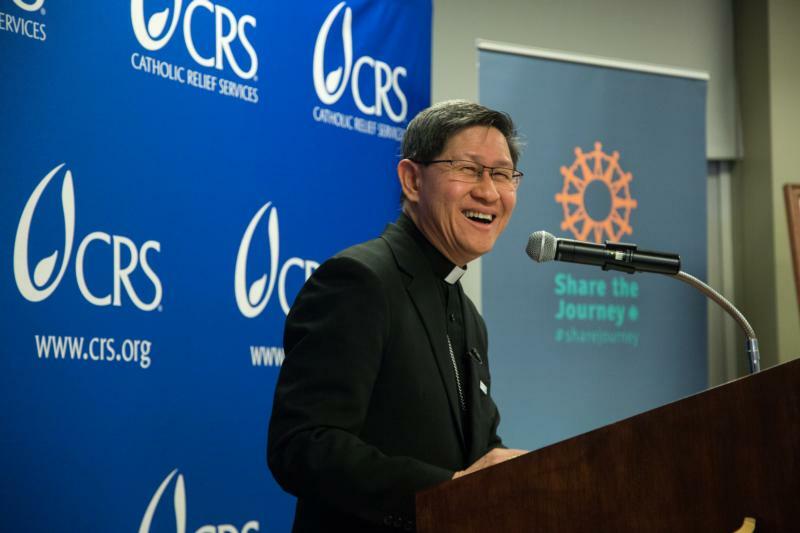 Cardinal Tagle spent the day with CRS staff, helping open the 75th anniversary observance of the U.S. bishops’ overseas humanitarian relief and development agency. The agency was established in 1943 to respond to the needs of World War II refugees in Europe. Called War Relief Services then, the agency’s first resettlement effort benefited thousands of Poles who had been forced from their homeland to Russian work camps. They eventually resettled in Mexico. CRS officials marked Cardinal Tagle’s visit by presenting Caritas Internationalis with its first Dignitas Award. The award was established as part of the anniversary observance to honor organizations working to eradicate poverty that are among the best in the world. The award depicts a mosaic of photos of Caritas’ work around the world with the center image of a flaming cross, a symbol from the organization’s logo. Cardinal Tagle shared stories during the award presentation and during his interview with CNS about his experiences since becoming Caritas’ president in 2015. The boy then asked why he was helping the people in the camp. Cardinal Tagle said it served as an invitation to explain that it was a matter of practicing his Catholic Christian faith to make a difference in someone’s life. He said such stories showcase how the call to community and human unity is necessary. “I see how we are connected to one another and how the church could be a force for transformation of society,” he said. However, Cardinal Tagle said the church’s approach to migration is not the sole answer to the crisis facing tens of millions of people around the world. It’s far too complex for one approach, he said. He called CRS one of the world’s most recognizable and respected humanitarian aid institutions in the world. He attributed that to the agency’s willingness to depend on local people with their expertise on cultural norms and specific needs. In the Philippines, the Catholic Church takes the same approach, the cardinal said, in responding to the drug addiction crisis facing the island nation. He agreed that the church has stood against Philippine President Rodrigo Duterte’s harsh campaign against drug dealers and users. The government’s campaign has claimed 13,000 lives since it was launched in 2016, according to several human rights groups. Catholic leaders have challenged the violent campaign, calling on the government to improve treatment options for drug addiction and to address the reasons people turn to narcotics in the first place. Cardinal Tagle told CNS that preaching the Gospel’s prophetic message is the church’s first responsibility no matter the consequences. In line with that vision, parishes across the country have opened programs that provide treatment, counseling, education and skills development so that people see there is hope outside of a world focused on drug abuse, he said. One program recently saw 150 people graduate who are on their way to employment, he said. “But there is much that we need to reach,” he said. A day before visiting CRS, Cardinal Tagle spent time visiting officials throughout Washington discussing the church’s view on migration and immigration and the need for a compassionate response for people on the move.